Should I Invest In A Key Organizer? What Material Makes The Best Key Organizer? How Many Keys Can Pocket Key Holders Accommodate? How Key Organizers Can Help Cut The Bulk? What Types Of Smart Key Organizers Are Available? Key organizers are making the ritual dance before leaving your home much easier. Instead of patting your pockets to check you have all your keys and fobs before setting off, the key organizer becomes your best friend. These items compactly and safely store a significant number of keys to reduce your chances of misplacing them. They’re also cool gadgets with a whole load of extra features. Many of them come with tools, bottle openers and you can even get smart key organizers. We’ll unpick those as we go through our findings. Our findings? That’s right! It might take you a while to find your keys after a night down the bar with the guys, but it isn’t difficult to find the best key organizers for men. We’ve been looking high and low to hunt down the best models currently on the market. We searched the usual places such as under the sofa, in the key bowl and in our jacket pocket. We also looked at the industry’s proven brands. As a result of the latter, we have 20 awesome designs to show you from renowned manufacturers. We have key organizers to suit every guy from the CEO to the action hero. For those who like a bargain but don’t want to lock themselves out of awesome features, they should get the Krufe expandable key organizer. For one of the most sophisticated key organizers found anywhere, scroll a few inches lower and discover this product which comes with an app. Our editor is loving this leather case design which maintains the sleek convenience with a touch of timeless elegance! The first key organizer going down a storm in the Men’s Gear research lab is the KeySmart Key Organizer. To call it a key organizer does it an injustice. First off, this product does store up to 10 keys securely and neatly in its casing. 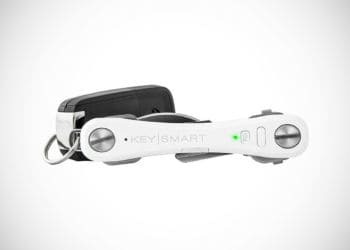 However, just as we have had the rise of smart doorbells and smart watches, we now have a smart key organizer. This key organizer can be tracked using Bluetooth via a free app so you never lose your keys. The app can even make the organizer play a tune to make locating it even easier. Move aside empty pizza boxes and bowls of popcorn from last night’s game – you have places to be! On top of the ability to find your keys using the app, this key organizer will even help you find your smartphone. Through some clever configuration, you can press a button of this key organizer and it will make your smartphone ring. It will even ring when you have left it on silent. Additional features include a space to keep your car key fob, an LED light and a cool bottle opener. This certainly is a sophisticated key organizer which is made even better with a two-year warranty. 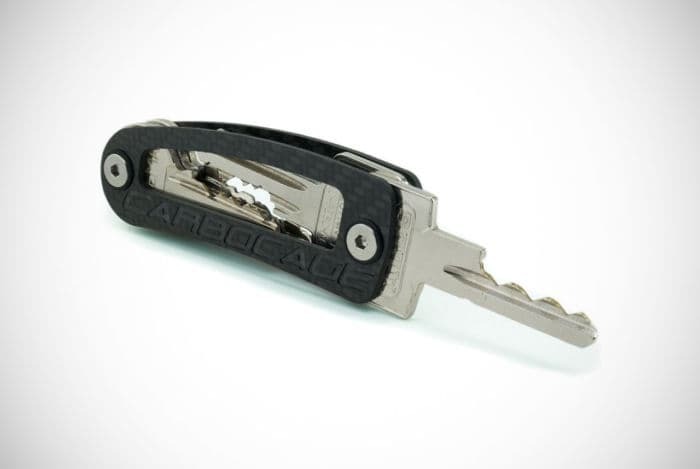 If the previous key organizer was a “swarve” and sophisticated gent wearing a suit, the Carbocage Key Organizer is a survival expert living in the jungle. There are no flashy features that can locate phones. And there are certainly no apps around. Yet, this one is just as great in a whole other way. This product was manufactured in Germany using reliable carbon fiber to make it both solid and lightweight. It is then put together using quality stainless steel bolts. 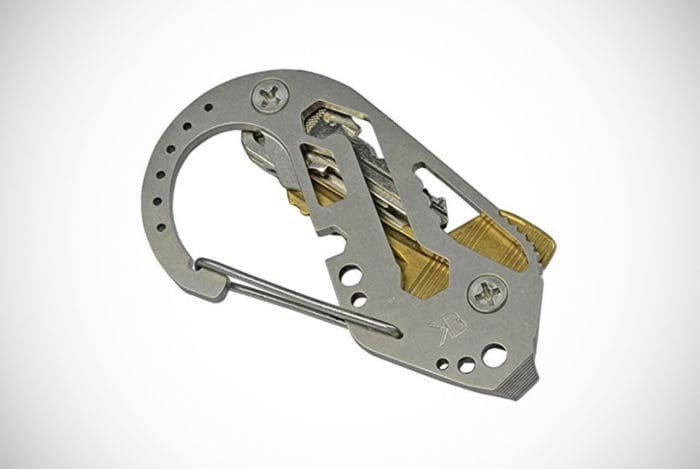 If you want a key organizer to last then this may be your best option. This model can hold slightly more than the previous key organizer with a capacity for up to 14 keys. One of the most innovative features here is its double-asymmetrical design. By making such a design, owners can locate the key they need by feeling them. This saves you time and adds to its convenience factor. Next up is the Northwall Key Organizer. This product has made our list of the best key organizers because it has been able to match cool rugged aesthetics with unrivaled practicality. In fact, there may be no competing with it for men that work with their hands and with tools. 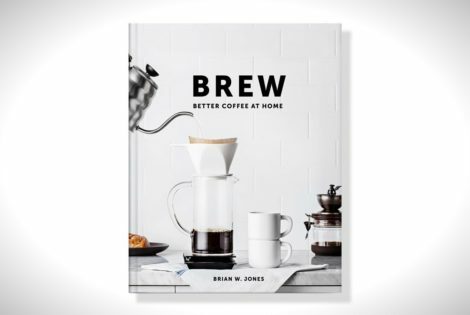 Maybe the perfect gift for a bro or a father? The holder aspect of the design can cater to regular flat keys, key fobs and even some small tools. Yet, you may not even need to add some of your tools to it because it comes equipped with one of its own. There is a compact and sleek tool already inserted into the design. This stainless-steel tool includes a flathead screwdriver, a box opener and a bottle opener ready for Monday Night Football. All of this quality comes in a casing of 100% vegetable tanned leather. This leather is available in a black or brown color. But it’s not just for aesthetic value. The leather acts as a soft cushion between your keys and valuable smartphone cases. With this key organizer, your keys are safe and so is your smartphone! 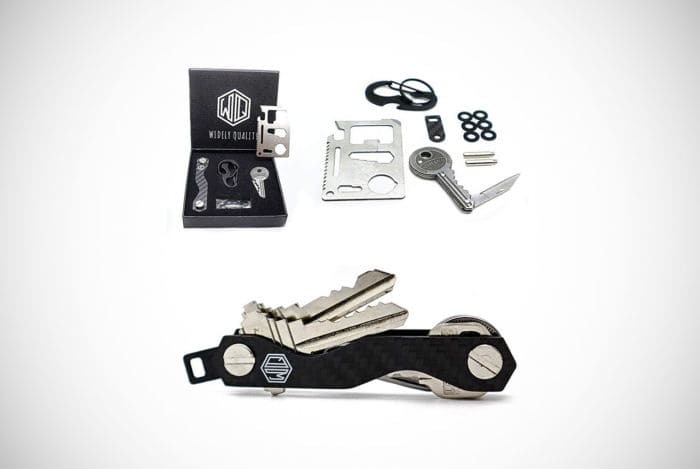 The Keytec Premium Key Organizer proves that good things come in small packages. This cool design is not just nice to look at, but it’s also made to last. By using aircraft grade and high-resistant zinc, they have ensured longevity from their product. Cleverly, they have then put this quality material together while including anti-loosening washers to make sure your keys never fall out. One of the issues when buying this product is that it must be assembled by you when it arrives. The good news is that assembling the product does not take much effort at all. Keytec will even send buyers an instructional assembly video straight to their inbox. However, we’ve saved the best features until last. Keytec has jumped on the chance to make their key organizer multipurpose like other manufacturers. This time, they have added a bottle opener, two holes to work as spanners and most inventively, they have even made a phone stand. Whether you’re commuting to the office or jetting off, you now have hands-free access when watching videos and films from your device. 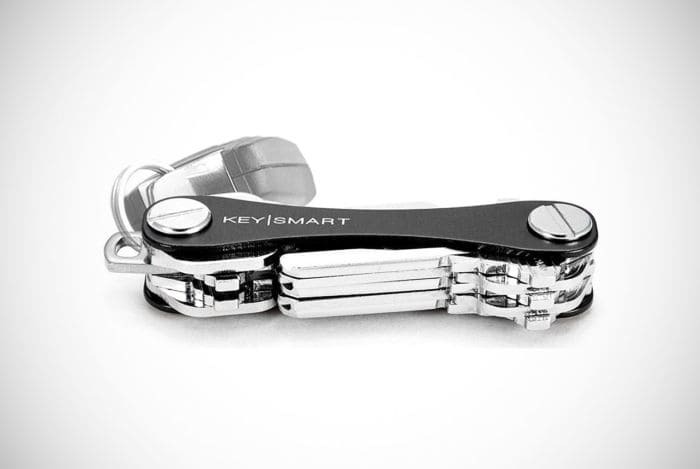 In a choice of three phenomenal colors, the KeySmart Key organizer is a real winner. Stop the jingle and eliminate the bulk with this key organizer with a lot to offer. 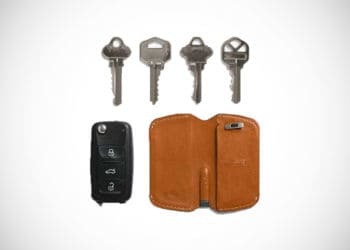 For starters, the product is one of the most modern looking key organizers on the market. Its sleek design does not just add to its appeal, but it also makes the product more compact and keeps your keys more secure. This model has space for up to 14 flat keys and can accommodate office fobs and large car keys because of the attached loop. If this isn’t enough for you the manufacturers sell expansion packs so you can add more keys to your key organizer. You can also choose to buy the company’s accessories and add them to your purchase. Again, this is another design which requires assembly on your part – but again it doesn’t require too much effort. The KeyBiner model certainly draws a contrast to many of the modern and sleek options out there. This key organizer is a true USA work and one of the most practical options on our list of the best key organizers. In terms of durability, the product is made of titanium to provide outstanding strength and resistance. When it comes down to features, this USA-made item is just as impressive. It may be able to store up to 14 keys, but it also has a few other tricks up its sleeve. 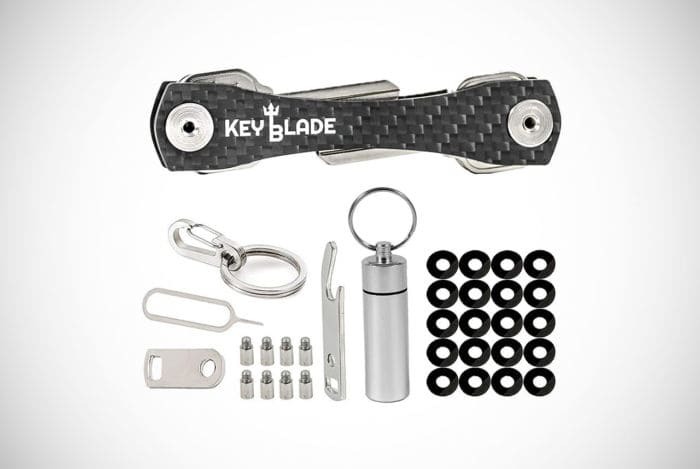 In fact, it is one of the most multifunctional key organizers available by offering a bottle opener, a screwdriver element, a carabiner, a file and a key ring to attach bigger keys and fobs. 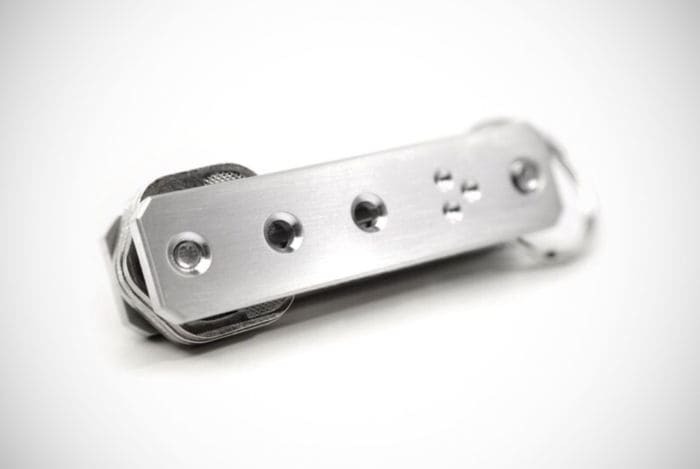 Hit the button below to discover more about this key organizer. For those that like a touch of leather on their cool accessories, here is a second option in that department. 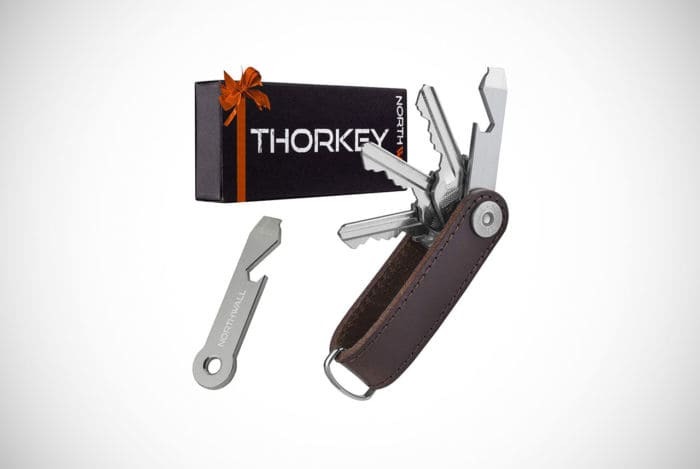 The Thorkey Pocket Key Organizer protects its keys in high-quality Italian grain leather. The leather adds character while also adds to its durability. Not to forget that leather bound key organizers prevent scratches on your shiny new smartphone. You can even choose the color of the leather between a classical black and a timeless cognac. 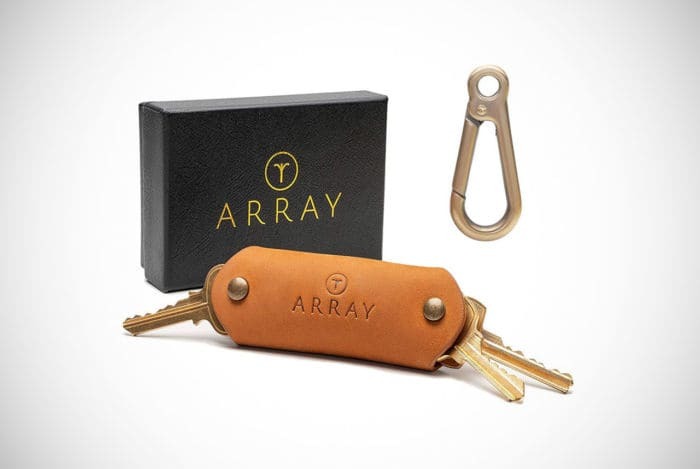 The key organizer here doesn’t just make you look like a real gent, it’s super practical too. Its capacity of ten keys is made better by the fact it can also hold car keys and office fobs. Never get locked out of the office or stranded in a car lot with this personal aid. Some of the poor-quality key organizers become loose over time. This will never happen with the ThorKey design because it has been made in a way to securely lock down your keys always and never risk bolts becoming loose over a long period. The icing on the cake is that this exceptional key organizer is supplied with a money-back guarantee. Next onto the main stage is the Cineik Key organizer. You will notice in the specs section that the guys and gals over at Cineik are claiming this model will hold a substantial 51 keys. This has been confirmed as possible by past customers when also using the ring attached, making this a must-have key organizer for men of certain occupancies. If you’re a security guard of a large establishment then you just found your new working buddy. Other than its significant key capacity, there are no other thrills here. Yet, this doesn’t mean that the product is short of quality. The manufacturers have applied a lot of attention to create a well-made key organizer to last a lifetime. They have used reliable materials and then applied polish to make it even more durable. Whereas many designs have added the familiar extras, this is a key organizer that has thought outside the box. Along with a large 20-key capacity, they have added the usual bottle owner but also a cash stash tube, a sim card opener and a carabiner opener. Never get locked out of your home or your smartphone with this key organizer! Using this product is made easier thanks to an accompanying instruction guide. Setting it up and tailoring the item for your number of keys is effortless because it can be assembled using just a coin. It comes with extra bits and pieces in case the product does break. If it does end up beyond repair, you can fall back on a full-refund-or-replacement guarantee. It comes in a stylish box, making this one of the better options when looking for the perfect gift for men. 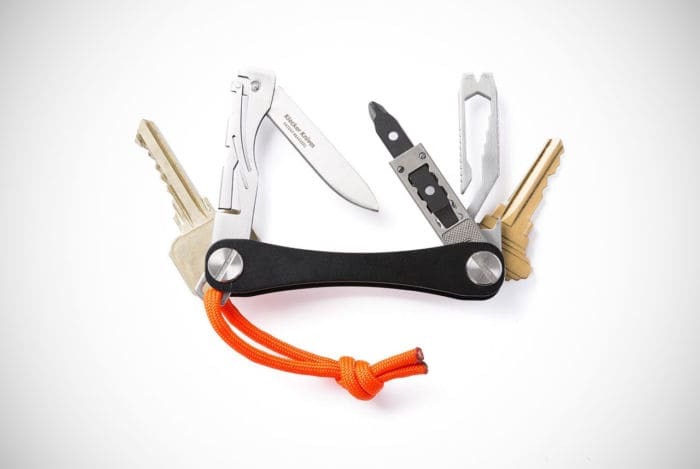 This key organizer doesn’t hold as many keys like some of the others, making it more suitable for urban dwellers with offices to go to – rather than security personnel. 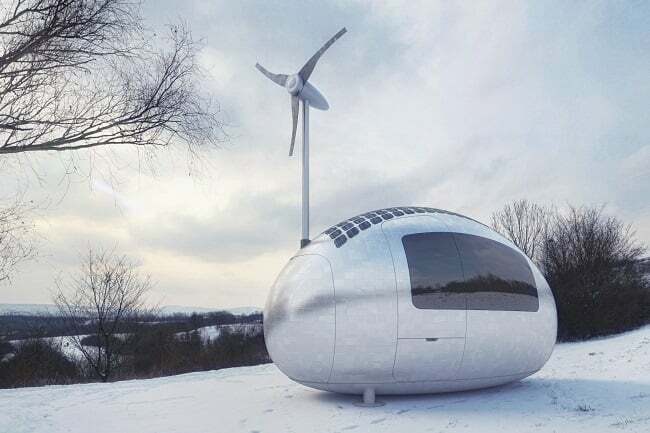 Nevertheless, it’s one of the coolest and most practical designs. We say this because the keys face one of two ways so you can organize your keys to the different sides as you wish. Little extras include a ring for fobs and a clip so you don’t even have to carry the key organizer in your pocket. For a wallet-friendly price, this is a reliable design made with the best materials. KeyBar has chosen aircraft-grade aluminum to fly their design to the top of the pile in the eyes of a lot of wise guys. 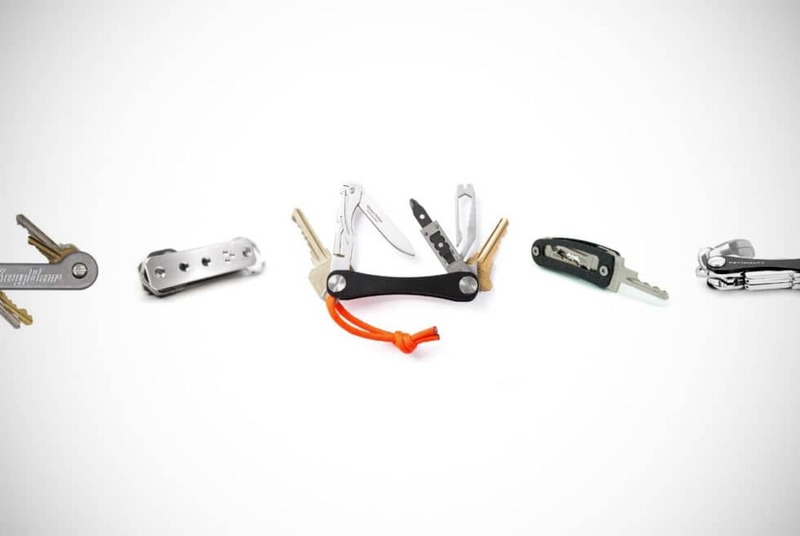 The best key organizer with a small capacity is arguably this one from Huckberry. Despite having a significantly smaller capacity, it’s of a different breed. The product replaces some of the room usually designated for additional keys and swaps it for cool and useful tools. Owners of this stainless-steel product also get a reversible flathead screwdriver, a folding pocket knife and a multifunctional pocket tool that offers a lot from opening bottles to scoring. The makers have even added an orange string to the key holder so you can locate it easily in low-light conditions. Impressed? Click below to discover more. 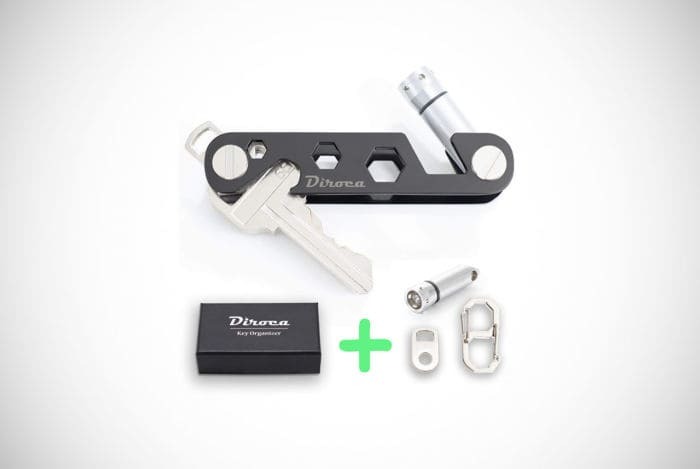 Over the half-way stage of our list of the best key organizers for men and this Diroca Outdoor maintain the standards. Available in a choice of three excellent colors and with multiple functions, this may well be your next key organizer. It’s made with aircraft-grade zinc which is also resistant to rust and corrosion. This key holder also includes rubber washers to prevent the screws loosening and your keys going missing. This is something that does happen on the key organizers of lesser quality. Yet, the craftsmanship is matched by some innovative features. 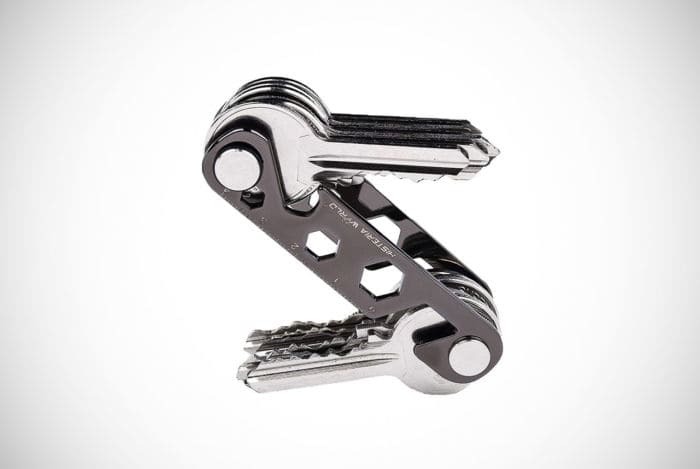 Buyers of this key organizer will find they also now own an LED light, bottle opener, carabiner, a small wrench and it can be reconfigured to work as a smartphone stand! 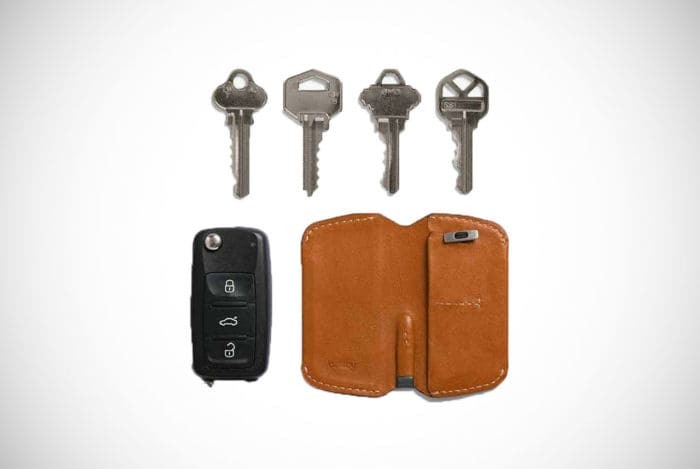 In a whole other direction but still traveling in the right direction is this Bellroy key organizer. Unlike the other industrial-type designs, this leather option is completely different. It is a streamlined case of premium leather that can fit between two and four keys. There is also a loop for those who need to attach gym and office fobs or your car keys. One of the best things about this aesthetic is that the leather casing can be chosen between six cool colors. The other positives are that the case has a magnetic closure so you can always be assured that your keys are secure. This one is for the sophisticated gent, let’s raise a brandy to it! 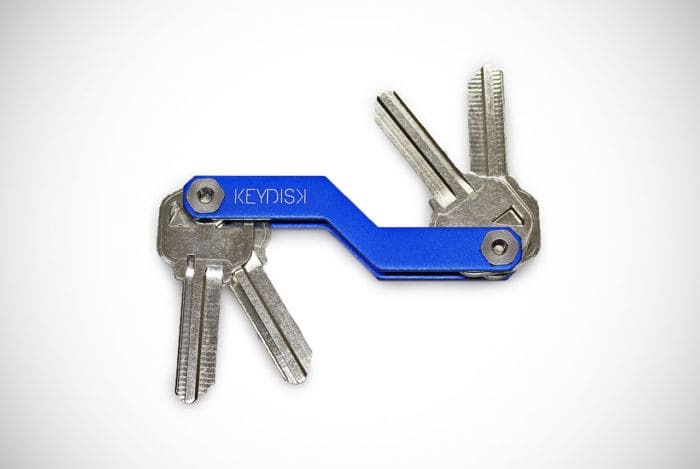 For a minimalist key organizer look no further than this model from Keydisk. If you’re getting one of these special products to reduce bulk, then this will be a front runner for you. The design itself is very slim – as the name suggests – but its innovative design is what reduces bulk even further. So far, we have seen key organizers that have bottle openers and rings to attach fobs and larger keys. Keydisk has cleverly merged these features together to make a bottle opener that doubles as a ring for fobs and car keys. These excellent design ideas are seen throughout, especially in the use of lightweight but strong aluminum for the body. For additional peace of mind, it comes with a satisfaction guarantee. 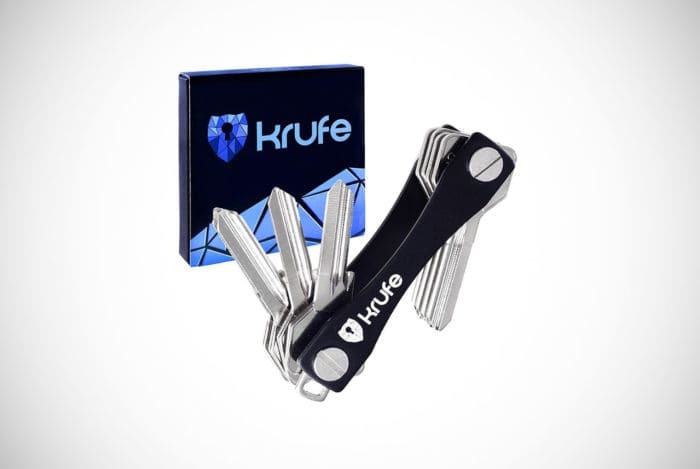 The Krufe key organizer has made our hall of fame for many reasons. One of the top reasons is the price. This model is unbelievably cheap and outstanding value for money considering what it includes. If you don’t believe us take a look by hitting the button below. It will keep a respectable eight keys secure and even more safe in the knowledge that it has anti-loosening washers inside too. On top of this, the product is multifunctional by including a sim card needle to eject your sim card when needed, a bottle opener, a metallic carabiner to attach it to your backpack and even a tube to store your cash. Moreover, you will receive a guide on how to organize other areas of your life. 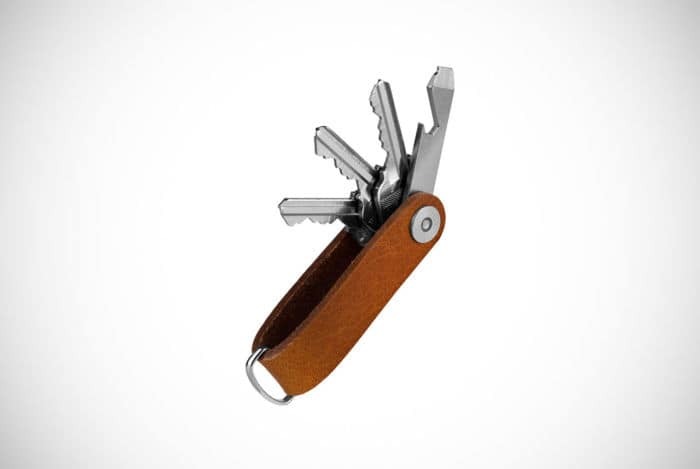 For the men who work with their hands, this key organizer will be perfect for you. Along with the 16 keys it can store, it offers some handy extra that are ideal for manual workers. The aluminum body is light, sturdy and houses these additional perks. Owners will have easy access to a bottle opener and a phone stand to make hands-free skyping possible. Yet, one of the most innovative additions is something we have yet to encounter. On one edge of the key organizer is a small ruler to help with daily tasks. All this quality is protected with a 12-month warranty. One of the key organizers with the biggest key capacities is the Arfkey design. All 28 keys are made secure with an anti-loosening system. When it arrives, you will have to assemble it to your key collection However, this is made simple through the company’s tutorial video. This model has plenty of additional features to get your teeth into. It has a ring for a car key, a chain to attach it to a belt to free up your pockets, a sim card pin and a bottle opener so you can celebrate buying a quality product. It even has a full-refund guarantee in case you aren’t completely satisfied. 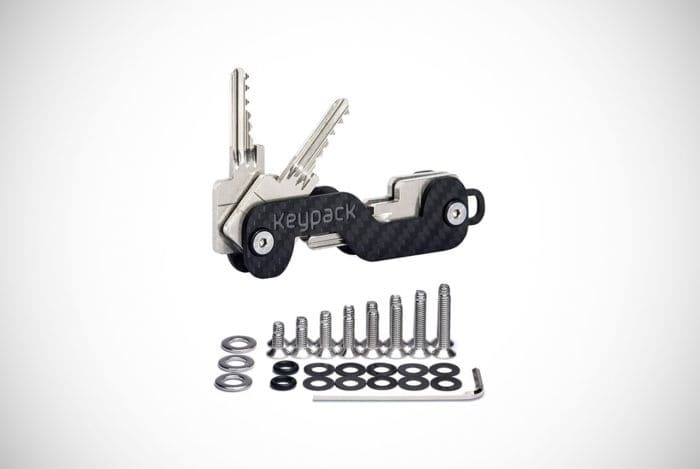 Make rattling keys a thing of the past with this lightweight and strong carbon key organizer from Keypack. Carbon key organizers are perfect for active people as these guys get to carry all their keys in the lightest way possible. The s-shape design of the product makes pulling out the key you need even easier. It’s surprising that not many other manufacturers have considered this design plus. The key organizer isn’t just a place to store an impressive 16 keys. It has a little more up its sleeve. The design can be configured to transform as a stand for your phone. Another carbon design to provide even more strength than steel and make the product lighter than aluminum is this KeyBlade product. Unlike the last one, this one is slightly more straightforward to put together. You just need a coin and a look over the supplied instructions. Again, the extras are what makes this special key organizer that little bit more special. Owners can choose to store up to 24 keys, or they can mix things up and use some of the included perks. Other parts of this product you need to know about include a carabiner, a key ring for bigger keys and fobs, cash tube, bottle opener and a pin to eject sim cards. If you came here looking for a gift for the men in your life, we’re sorry we made you wait until last to find the perfect option. 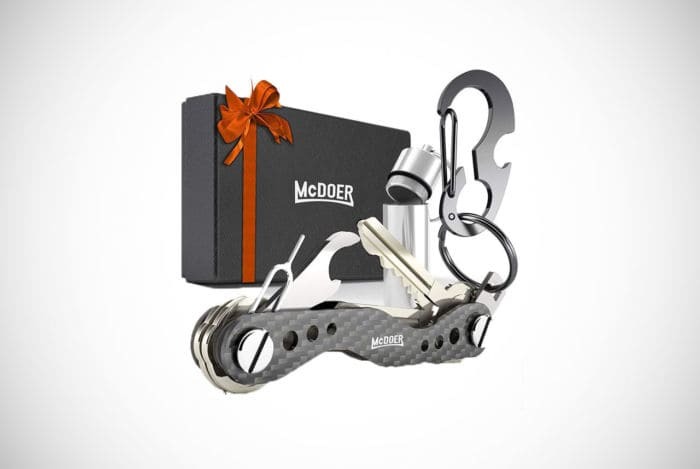 This gift set doesn’t just include an outstanding key organizer made of trusted carbon, it is a box set with many other perks. The cool box includes all the bits you need to fit your keys to the organizer. However, the best things inside this box is a multi-tool card that has multiple functions for different situations. This is on top of a Bond-like key which folds out to become a knife – and a bottle opener is included, of course. Key organizers are hardly a sizeable investment. Most of them come relatively cheap and all can be picked up without a phone call to the bank. Yet, they are still an awesome purchase for all guys. But, why should you get one? Key organizers offer exceptional practicality. Instead of losing your keys, jingling like a member of Santa’s sleigh or struggling to find the right key, a key organizer makes everything simple. These products store your keys in one secure and compact place while keeping them accessible. 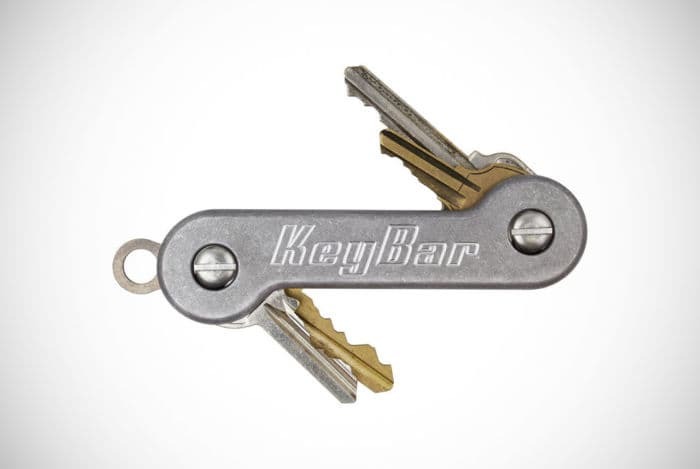 This reduces the amount of bulk in your pockets, the amount of noise you make when carrying many keys and helps to stop you from losing your keys. Unless you enjoy putting your hand down the side of the recliner and climbing through windows trying to get into your own home, you should invest in one of the best key organizers we’ve featured above. Key organizers can be made using different materials. Most often, they are made with sturdy and reliable material such as titanium and stainless steel. There is also a select group of in-demand key organizers made from carbon. These are in high demand because they combine the durability of the former materials with lightweight convenience. If you are carrying many keys at once then making it as lightweight as possible becomes exceptionally desirable. Another popular material used in the production of key organizers is leather. Naturally, different types of leather may be used, including authentic and synthetic leather. The quality of the leather can greatly influence the overall price. Leather is popular because it adds a timeless gentleman aesthetic to the product and they match many other guy’s pocket items such as leather wallets and smartphone cases. However, leather key organizers aren’t just a great option to add style. The use of leather offers a practical solution. Many guys will have unloaded their smartphone to find scratches on the screen and case. This is caused by loose apartment keys and car keys grazing against your smartphone when stores in the same jeans or jacket pocket. The soft leather of leather key organizers provides a barrier between the damaging edges of your keys and your expensive smartphone. Not all key organizers are created equal. 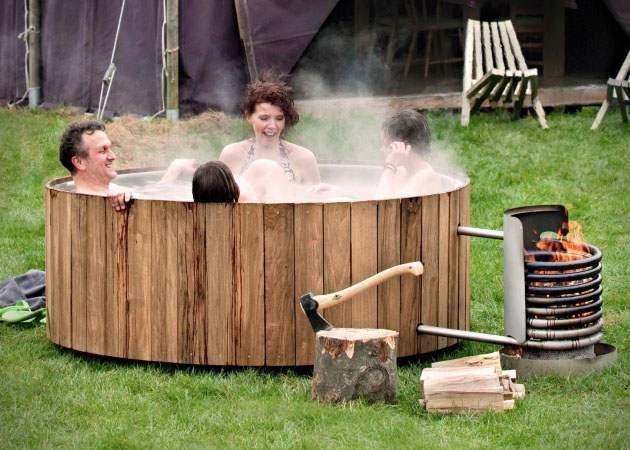 Some of them are designed for the everyday guy who just has a couple of keys to get into their apartment, office and the beer fridge in their man cave on a Saturday night. Most key organizers will, therefore, accommodate the majority of the male population. However, you can also get key organizers that have well beyond the 10 to 15 key spaces. For security guards and janitors who need to carry up to 40 or more keys at one time, there are also key organizers for you guys. There is also something else to weigh in when choosing a key organizer based on how many keys it can hold. Some key organizers will offer a loop so that the owner can attach a larger key, such as a car key. The same loop can often be used to hold a fob made for an apartment block or to gain entry into an office. Other key organizers may afford the owner a small tool incorporated into the design. 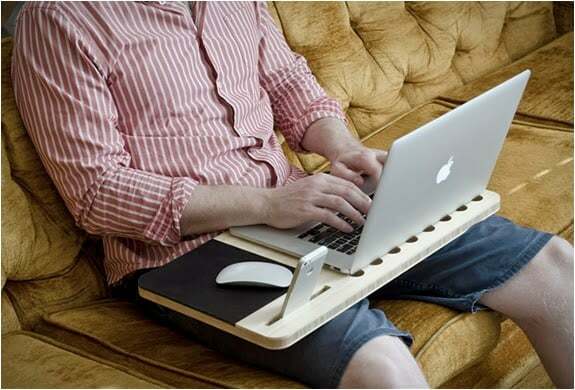 This may include a bottle opener, spanner, file, smartphone stand, rulers or other innovative ideas. When your keys lie in your pockets naturally, they spread out ready to prod you in the backside whenever you sit down. When keys spread out in this way they may also prick holes in your clothing. Even some tactical clothing is not going to withstand some keys when thrown in a pocket like this. This is where a key organizer comes in. They are the go-to product to prevent the bulk of a set of keys rattling around in your pocket. Most designs stack your keys within a metal and/or leather casing. This means they do not spread out ready to attack your favorite skinny jeans. They are stacked in a way that you can flick the key you need out, so it is ready to use. Therefore leaving all the other keys compactly stacked together. But this isn’t the only way a key organizer cuts the bulk. As we mentioned already, these products can be multifunctional by also including small tools such as screwdrivers and bottle openers. By having these attached to your key organizer, you no longer need to carry them as separate items. Key organizers have been going to university. Well, not quite but they are getting smart. 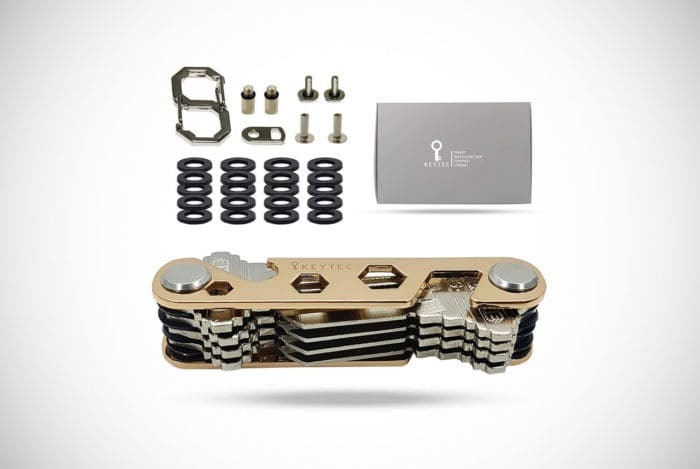 Just like many other products which are becoming more sophisticated through using technology advancements, the key organizer has done the same. Some models of key organizers are now smart key organizers. These models can vary in capabilities but a popular find – which also features at the top of this buyer guide – is that they can be paired with an app. What this does is it lets you can find your key organizer when lost. The app usually provides a map that can locate your key organizer. Some key organizers can even be paired with your smartphone via Bluetooth technology and make your smartphone ring if it is lost. They can still make your smartphone ring even when placed in silent mode! Has the locksmith turned up yet? Or maybe you weren’t reading along while locked out of your apartment wishing you had already bought a key organizer? If you were reading before that happened, you’re a smart guy and now you know all the benefits of getting one the best key organizers for men currently on the market. 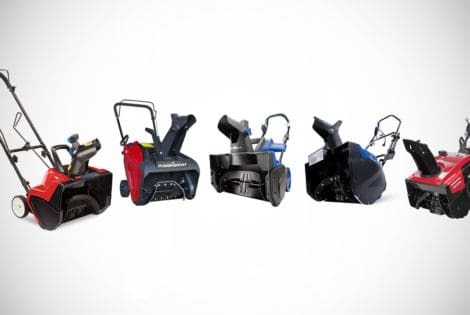 We’ve been able to provide you with plenty of quality options from the best manufacturers. You’ve been able to browse sought-after key organizers from the likes of Huckberry, Keypac, Keytec, KeySmart and many more. 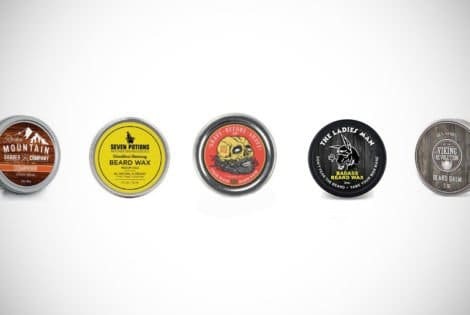 These 20 options provide different key capacities and extras to cater to any guy. Our list also covers a range of budgets too. That wraps up our look into these convenient products. Before you jump over to take a longer look at your favorites, make sure you’ve taken our advice and guidance on board. Keep these things in mind to make sure you get the best key organizer for your needs.